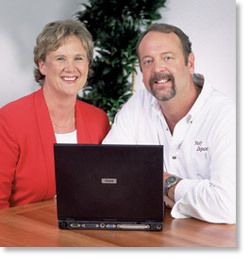 Study Depot–founded in 1999 by Colleen and David Christopher– provides comprehensive supplementary education for elementary, middle, and high school children in North San Diego County. 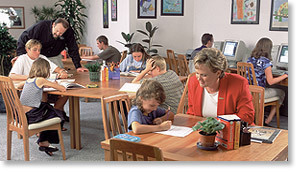 At Study Depot we work hard to be the #1 Educational Resource for your family in North County. If you are considering our services, we invite you to read Our Guiding Philosophy Statement and Our 12 Guiding Principles of Business. This is our commitment to you. As professional educators and committed business owners, Colleen and David Christopher provide a dynamic and supportive environment for your children and they are the nucleus of The Leadership Team at Study Depot. 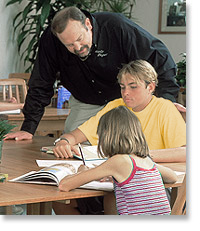 Your child will become more confident and organized with focused attention from our Expert Tutors. Students produce quality work and feel more successful when they work in an Optimal Learning Environment: Welcome to Study Depot. “We believe children are inherently compelled to go the extra mile in life once they experience the possibilities and reap the rewards of taking those extra steps in any area of their lives. We are committed to traveling the extra mile with students in their academics, and believe this will translate to a lifelong quest for excellence”. Interacting on a daily basis with teachers, parents, and students, we hold ourselves to the highest standard of professionalism. We provide the highest quality tutoring in the most cost effective combination of venues possible. We strive to be the best tutoring service, not the cheapest. Because our tutors must be able to work with each student’s coursework, it is imperative that we hire the best. Along with high-level expertise in content areas, our staff of expert educators thoroughly enjoys being part of the process of teaching and relishes time spent with their students. Early exposure to college creates a direction toward that goal. Students and parents receive the information they need to plan for college and the motivation to act on the information. The Study Depot EXTRA-MILE Scholarship Fund assists a few extraordinary students with reaching their college goal and gives any student who is interested, an opportunity to amass numerous community service hours. Our ultimate goal is to spend time with our family and live a quality life. We promote this for all our students and their families. Colleen Christopher, M.A., M.Ed. is a dynamic educator and communicator and is known for her ability to motivate students of all ages. She has over 30 years experience as an educator and has taught in a variety of settings. As a credentialed teacher, Colleen’s Masters in Education enhanced her students’ learning experiences. Her work teaching Speed-Reading and Advanced Learning Techniques in corporate and military settings added to her teaching repertoire. Colleen gained her second Masters Degree and the subsequent license in Marriage and Family Therapy as a means of developing a deeper understanding of communication styles and skills as well as family dynamics. Integrating all of these tools and combining them with her passion-the quest for quality education for children-is her primary goal as Director of Educational Services and Co-Owner of Study Depot. David Christopher, M.S., M.A. is an educator with more than 25 years experience who serves as an adjunct faculty member at Palomar College and a consultant at to Thomas Jefferson School of Law. He is a highly sought after public speaker and lecturer. As a licensed Marriage and Family Therapist, he has extensive background working with adolescents and parents. As a graduate of one of the finest schools in the country—University of California at San Diego—David understands the importance of academic excellence. David is the Director of Operations and Co-Owner of Study Depot. While creating the model of an individualized educational program at Study Depot, they have actively worked to enhance the educational community. They created the Study Depot “EXTRA MILE” College Scholarship Fund in fall of 2002, established the Fund as an Official Charity of the San Diego Marathon within weeks, and will run in the Marathon for the second year in a row on January 19th, 2003. Leadership, innovation, and absolute commitment to excellence form the heart of Study Depot’s ownership group. Our tutors are committed to the success of their students and even more importantly, to each student developing a sense of academic mastery. The capacity to work with a wide range of students, supporting students in completing their work in a timely fashion while building excellent study habits at home is essential. Some of our qualifications include advanced degrees, educational certifications, teaching experience & knowledge of current educational trends and methodologies. Every aspect of the learning environment was planned and implemented to enhance the student educational experience. The lighting, furniture, materials, colors, plants and artwork were all chosen with the student in mind. Experts in space management and Feng Shui were consulted before decisions were made regarding the development of the resultant learning environment. The outcome is an environment that promotes alertness, comfort and an ease of retention. Students and Staff enjoy the time they spend at Study Depot.